The Royal Naval Cadets of HMS Collingwood are lucky to be based within one of the largest naval establishments in the country, the Royal Navy’s Maritime Warfare School. We benefit from the support of our parent establishment including use of a fully kitted out gymnasium and sports facility. Youngsters enjoy training and competitions in military and naval skills, as well as sports and adventure training while developing an awareness of their community and service. In addition to instruction in skills and sports, VCC cadets also get the chance to attend camps during school holidays and represent their units at major public events such as Remembrance Day and Armed Forces Day. One of our really popular activities is the cadet Field Gun. Cadets can join our active and well-known field gun crew and compete against other cadet units for team and individual trophies. The cadets pull an original Boer War 7 pounder muzzle loading field gun weighing over a third of a ton along a 100 yard course, swapping the wheels over half-way to simulate crossing an obstacle. The wheels each weight 70 pounds, about the same weight of one of our cadets, and after running at full speed the cadets can certainly be seen to be earning their victory. In the past the cadets have appeared at the Royal Tournament and more recently at HMS Collingwood Field Gun Open days, HMS Sultan Summer Shows and Shropshire Country Fair. All of our cadets get to wear the traditional Royal Navy ratings uniform including ‘working rig’, and participate in traditional naval ceremonies. The cadets also take part in parades so their local community get to see how smart they are. 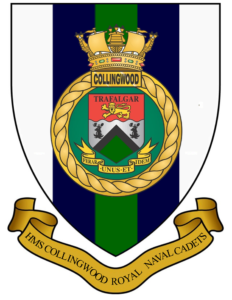 Address: HMS Collingwood RNVCC, HMS Collingwood, Newgate Lane, Fareham, Hampshire, PO14 1AS. Training Nights: Mondays and Thursdays 1800 to 2000, plus target shooting on Saturday mornings.